If you want to learn Japanese, you can’t avoid learning how to read Japanese. The Japanese writing system is unique and beautiful, no doubt about that. It is also famously complex. Unfortunately, that can put off any newcomers to the language. Don’t be afraid of the Japanese writing system! Yes, it’s complex, but it’s also logical. Anybody can learn it! In this article, we’ll talk a bit about the structure of the Japanese writing system. We’ll also talk about the best ways to approach learning to read Japanese. 8 What are Jouyou kanji? First off, did you know Japanese actually uses four scripts? Yep! Don’t panic, that may sound like overkill, but in fact, this will make your life easier. In fact, you already know one of them! Romaji is a special case. Romaji means ‘roman letters’. Guess what – roman letters are what we use every day in English. It’s what you’re reading right now! However, romaji is mainly used for translating things for non-Japanese speakers. Sorry if you thought you’d spotted a shortcut – it isn’t commonly used in everyday Japanese. The remaining three scripts – hiragana, katakana and kanji – are all used every day in Japanese. A typical piece of Japanese writing will actually use all three scripts, mixed together. This is because each script has a distinct purpose. Each one indicates a different part of the language. They work together to show you the function and origin of each word. In Brazil, the biggest Rio de Janeiro carnival has started. All the dancers wore beautiful costumes and paraded 700m while singing and dancing samba. Kanji – complex characters, taken from Chinese. These are used for basic blocks of meaning. They are the foundation of many words. Hiragana – simpler characters with a rounded shape. This is a phonetic script used for grammatical functions, word endings and similar. Katakana – simpler characters with a more ‘spikey’ shape. This is a phonetic script used mainly for foreign loan words. You can see how all three scripts are intermingled in the same sentences. Romaji, or roman letters, are used for writing Japanese sounds in English letters, to help non-Japanese speakers read Japanese. Sorry, my friend. That isn’t going to work. Although romaji is an official script of Japan, as sanctioned by the government, it isn’t used in usual Japanese writing. Instead, it’s mainly used for translating road signs, town names, train timetables and so on, for the benefit of foreign visitors to Japan. It’s also used in text books and language learning programs for beginners. However, a good language learning program will move into hiragana as soon as possible. That’s because unfortunately romaji is just not used for real Japanese! If you ever want to learn to speak and read Japanese fluently, you will just have to learn the other three scripts. Hiragana is a phonetic script. This means that once you’ve learned it, you will know how to pronounce any word written in hiragana. Hiragana has 46 characters. Each character corresponds to one syllable. These syllables represent all the sounds in the Japanese language. So once you know hiragana, you can read and say anything in Japanese! I recommend learning hiragana first. It’ll be an essential foundation if you want to learn how to read Japanese. 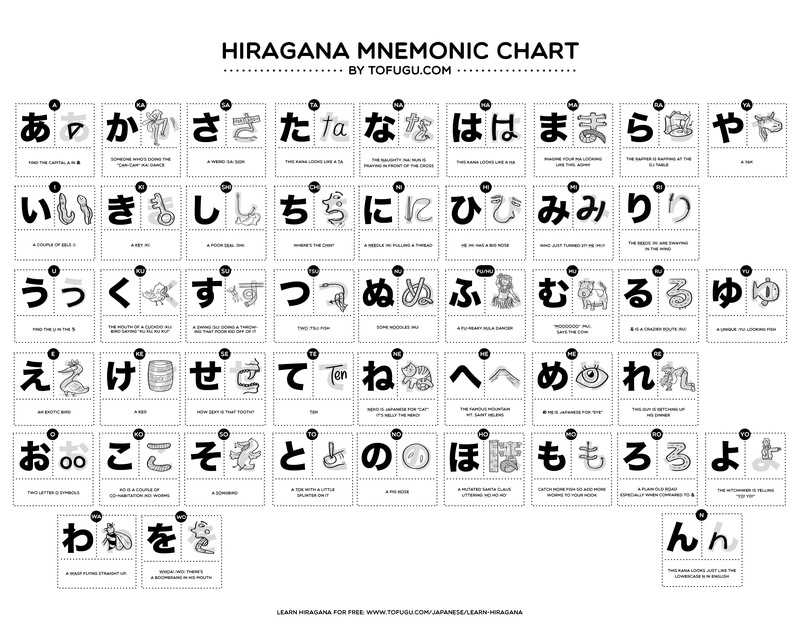 You can find our cute hiragana chart here. Any and all Japanese words can be written in hiragana. You will often find children’s books, or Japanese study resources for foreigners, written only in hiragana. But, as you can see in the example text above, in natural Japanese, hiragana is just one of the three scripts. In usual Japanese texts, hiragana is used for grammatical functions such as verb endings and particles, and also for some Japanese words not written in kanji. Here’s an awesome video from JapanesePod101 which introduces the shapes and pronunciation of all the hiragana characters. I really like the fun memory tricks to help you remember them! If you want to practise writing the characters from the video above, you can download some great free printable hiragana worksheets here. Katakana is also a phonetic script. It also has 46 characters, which represent the same syllables as hiragana. So why do they have both? That’s because katakana is used for words of foreign origin. Any word which does not have a traditional Japanese word is written in katakana. This includes foreign people’s and place names, words for foreign foods and sports, new technologies, and anything else which doesn’t already exist in Japanese. As you will see in the text above, katakana have a distinctive look – kind of spikey compared to the rounded shapes of hiragana. Katakana is another essential building block of the Japanese language. You will want to learn it soon if you want to read Japanese fluently! Head over to our page on katakana for more info and a colorful katakana chart. Also, grab these free printable worksheets to practice writing your katakana. By the way, hiragana and katakana are together known as ‘kana’. The last of our Japanese writing methods is kanji. The Japanese word kanji (漢字) literally means ‘Chinese characters’. This is because – you guessed it! – the Japanese language borrowed them from Chinese. Kanji are logographic characters. This means that each character represents a block of meaning (unlike the kana, or the English alphabet, where each character represents a sound). One single kanji character could be a word by itself. Or, some words are formed by two or more kanji together, or kanji plus hiragana (in this case, the hiragana is usually for a grammatical ending). Kanji are probably the biggest challenge for most people who want to read and write Japanese. Unlike hiragana and katakana, kanji are not phonetic. That means you have to learn the pronunciation along with the character each time. You won’t necessarily see a new kanji and know how to pronounce it – although as your knowledge of Japanese gets more advanced, you will see that there is some kind of logic, and you may be able to take an educated guess at the pronunciation of a new kanji! Since kanji came from Chinese, most of the characters actually have two possible pronunciations. This is because one pronunciation was borrowed from Chinese, and one is the Japanese pronunciation that was applied to that kanji. Usually the Japanese pronunciation is used when the kanji is a standalone word. We call the Japanese pronunciation kunyomi or ‘meaning reading’. The Chinese pronunciation is used when the kanji is part of a compound word. This means the kanji is joined together with other kanji to make a longer word. This is called onyomi or ‘sound-based reading’. Take the simple kanji 山 – mountain. The Japanese word for mountain is yama. When you talk about mountains in general (“oh, look at that huge mountain over there!”) you will use the word yama. However, the Chinese pronunciation of 山 (mountain) is shān. When the Japanese language borrowed the character 山 from China, it also borrowed the pronunciation shān. That pronunciation became san or zan in Japanese. We use the pronunciation san or zan when the kanji is used in a compound word. So, the name of Japan’s tallest mountain is Mount Fuji. In Japanese, that’s 富士山 – Fuji-san. The Japanese pronunciation – used when the kanji is a standalone word – is called kunyomi or ‘meaning reading’. The Chinese pronunciation – used when the kanji is part of a compound word – is called onyomi or ‘sound-based reading’. Don’t worry too much about the different pronunciations for now. It will all make sense when you start learning words in context. This article is just to give you an overview! I don’t recommend learning kanji until you are already comfortable with hiragana and katakana. There are over 40,000 kanji altogether. But don’t panic! You don’t need to know all of them. Think of English (or your own native language). You don’t know every single word in the dictionary, right? There are lots of very specialised words, which you would only learn if you had a particular profession or interest. Japanese is the same! You don’t need to know all the words, or all the kanji, in order to read and speak Japanese fluently. The government have made things easier by publishing a list of 2,136 kanji which they think are the most essential. These are called jouyou kanji. Jouyou literally means ‘daily use’. Japanese schoolchildren are expected to learn all the jouyou kanji by the time they graduate high school. If you can learn all 2,126 jouyou kanji, you can consider yourself functionally literate in Japanese. In other words, you will be able to read Japanese newspapers and books to a good level. 2,000 sounds much more achievable, doesn’t it? You can see a list of all the government-approved jouyou kanji here. The list is broken down by the school grade when Japanese students learn them. I bet you can get on the same level as a Japanese first grader pretty soon! There are several different methods for learning kanji, which we discuss here. And if you’re ready to start learning to read and write some kanji, you can download a free kanji workbook from JapanesePod101 here. There are lots of free resources online which can help you learn to read Japanese by yourself, no classes required! If you’re curious, I really recommend making a start. You can probably learn hiragana and katakana in a day. Kanji take longer, but you can learn enough kanji to read basic texts in a few months. As you might guess from my recommendations above, I really rate the website JapanesePod101. As well as free worksheets and quizzes, they have free beginner Japanese audio and video lessons. I listen to the audio lessons on my commute and they really helped me a lot. If you have any other top resources to learn Japanese reading and writing, please share in the comments below! NextWhat’s the Best Way to Learn Japanese?